You've had a good run, but your time is up. We've found something else, and it's being delivered ASAP. Consider our time together during last night's Sox win your swan song. 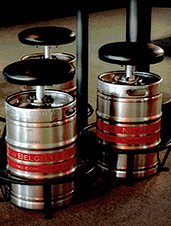 It's called the Keg Stool, and it pretty much is exactly what it says it is. It's a barstool, made with an empty keg. The way we see it, the Keg Stool gives us what you always gave us—a place to sit while we hoist a few cold ones with friends—with the added benefit of being made from one of our favorite objects: a real, full-size, gloriously American beer keg. By the way (and this may be more info than you want to hear), you can order the Keg Stool either with an empty keg or without one. It works with all kegs from major breweries (Anheuser-Busch, Coors, Miller, Pabst), but since we don't have an empty keg lying around (it's been a few years since college), we've ordered the complete package, which you can easily assemble in a few minutes. Well, you can't. You're a barstool. But we can. And we will.